Adding decals to a plain megaphone can make it sparkle! If you're looking to decorate your cheerleading accessories, decals for cheerleading megaphones might be just what you are looking for! Adding decals to your megaphones is a great way to customize your own personal megaphone. You can deck out your megaphones whether or not your entire squad has one or two megaphones to use, or even if each squad member has their own megaphone. Not always, but often, its up to the squad captains to decorate one or two squad megaphones. One thing to keep in mind is where the megaphones will be seen. You may want a very different look for competition day than you do for the school pep rally. Generally speaking, decals cannot be removed so it's best to keep in mind that whatever you do to the megaphone is permanent. It is not uncommon for schools to use one megaphone for games and another for things like competition. The megaphone that travels back and forth to games is likely to put on a lot more wear and tear. If you're putting decals on a group megaphone, use decals that have to do with the school mascot, the school name or something else representing the group. Sometimes, each cheerleader on a squad has her own smaller megaphone. If this is the case, check to see if your squad wants the megaphones to be identical before adding any decals. Assuming that a little individuality is okay, consider adding your name, your nickname, or even the year you are graduating in addition to any school spirit related decals. The area to which you are applying the decal must be clean and dry. Use a burnishing tool and rub the decal onto the megaphone. Remove the carrier sheet very slowly, rubbing as you remove the sheet. Use the burnishing tool again with the backing sheet in place. See manufacturers instructions for how to finish the decal. There are a variety of places where you can buy decals for your megaphones. 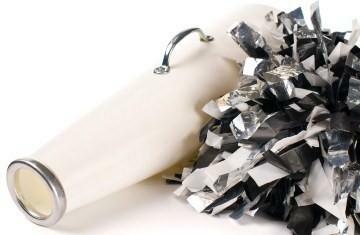 First, try using the place where you get your other cheerleading supplies. They may throw in extra perks like applying the decals for you, or providing them for free or a discounted rate. They appreciate repeat customers and your business and if they provide a decal service, this is definitely the way to go. If you haven't bought uniforms for awhile, or if you need to try a new supplier there are still several that provide decals. Spirit Decals deals exclusive with school spirit themed decals. As a result, they have a substantial collection of just about anything you could possibly want. They also do custom orders so if you have something that you created, that could be made into a decal as well. Cheerleading.comhas all sorts of spirit related products and when it comes to decals they do not disappoint. They offer mascot decals and letters in various fonts.